Earlier this year I had the opportunity to photograph one of my favorite types of clients. They are a small business, local, and make delicious desserts! So many wins. They make handmade Mexican popsicles, called Paletas, from scratch using natural and fresh ingredients. They also have a seasonal menu that can change but they keep a core group of Paletas year-round. During my visit to their downtown Chandler, AZ location, I shot 4 of their year-round Paletas. You can see some of my favorites of the ones I took below and you can visit their site by clicking here. Today I want to give you some tips on photographing frozen foods and a simple styling technique! Depending on the environment that you're in, whether you are using artificial lights or natural, you'll have to move as quickly as possible to snap the product in it's best and preferred frozen state. With this idea in mind, it's also a really good idea to have a basic plan in place before shooting. Think about your setting, where you are going to place things and what items you want to have nearby. Keep the product(s) frozen until you need them, and when it comes time for it, move quickly! 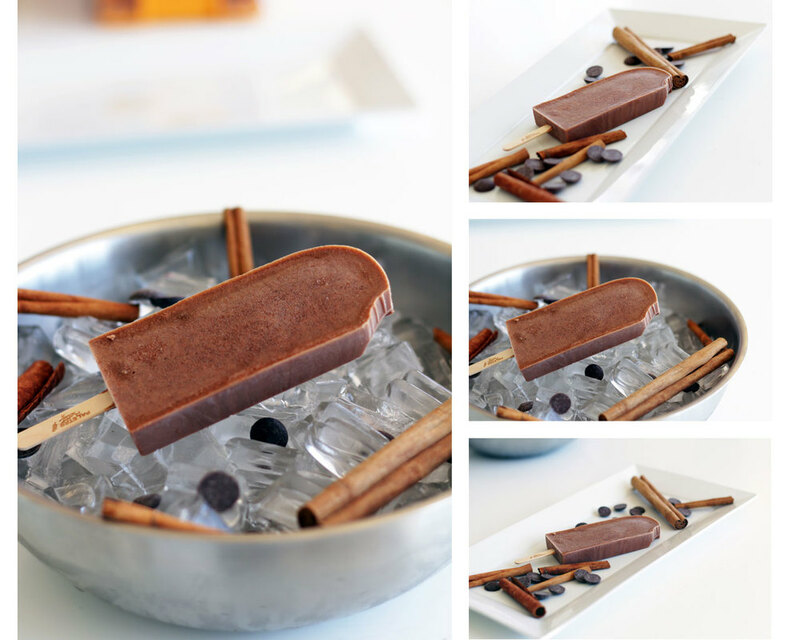 Ice can serve several purposes during a frozen food shoot. Because I was shooting popsicles, placing them on ice brings the psychological appeal of "cooling down". There is no doubt that these desserts do really well in the summer. The visuals of a tasty frozen popsicle sitting on top of ice really drives the idea home that this will cool you off and be the perfect treat on a hot summer day. Ice also adds an element of non distracting texture! Because it's clear and transparent, it won't be competing with the main product you are trying to shoot, but simply adds a lifestyle element to the product. Not only will it add texture, but the bonus is that your product will keep intact a bit longer than it would without being surrounded by ice! It will allow you to shoot a bit longer and play around with different props and elements. Less is always best when it comes to adding props. Try to incorporate a few ingredients of the product that you are shooting. Props should add to a photo not distract from it, so start with a few ingredients, take a few shots to see how it looks, then either add or subtract depending on how the photo looks. This photo below shows a lot of strawberries. I decided in this case to go with a circle of the fruit because it creates such a great contrast against the dessert itself, and the main ingredient is strawberries for this strawberries and cream Paleta! Try and use natural light if you are able to. Many artificial lights can produce a lot of heat, so it's a good idea to stay away from anything that will speed up the melting process. Sometimes showing the product melting can create a beautiful photo, but you'll want the product to stay in it's preferred state for as long as possible! So if you're able, try and shoot without staged lights and just in natural light. In case things start to melt faster than expected, it is a good idea to have a back up of the product for "safety" purposes. In film, when shooting a scene, there may be times when it may have gone perfectly, but there's always that director that will call, "One more for safety!" to shoot it again just in case anything were to happen to the footage. It's a good idea to have a back up of the product or a prop, just in case. One more for safety! 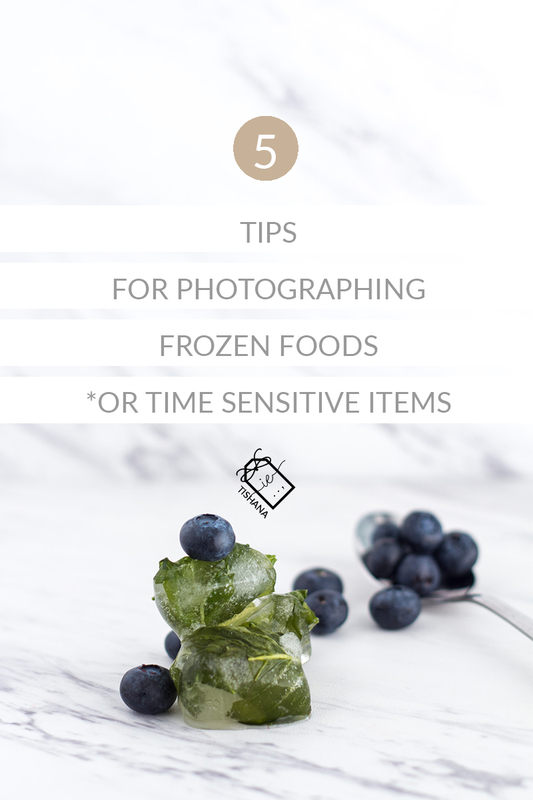 I hope these tips on photographing frozen foods will help you in your next shoot! Comment below and let me know what you have planned!